Those who tell you how heaven looks like are liars. How can we describe a place that is standing out of our own existence, using our limited wording that comes from our limited understanding of the world? In the era of numbed down vocabulary communication, abstract sounds and sonic themes are a more accurate way to describe something that is extraordinary. 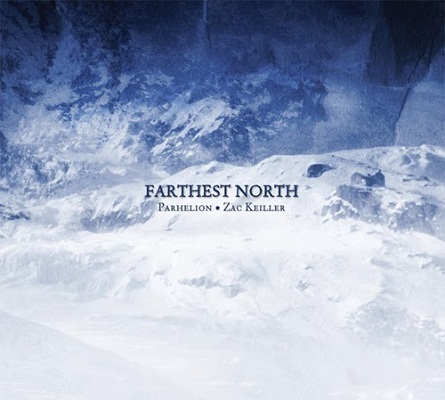 Parhelion and Zac Keiller have gone to the extreme journey to the Fathest North, and their documentation on this album cannot be more successful. You can read the track titles and imagine the chain of events that took them to that extreme port at the north, but the music, combining what sounds like field recordings and heavy tones drowned in a magical reverb. Parhelion and Keiller leave civilized sound and venture into the unknown, sometimes hostile wild world, where frozen monuments of drones pierce the heavy moving cold sea of eerie sound pads. A wonderful documentation, ‘Farthest North’ is a chilling and fascinating creation.